According to a scientific report, the supervolcano that lies beneath Yellowstone National Park in Wyoming is far larger than was previously thought. A study shows that the magma chamber is about 2.5 times bigger than earlier estimates suggested. A team found the cavern stretches for more than 55 miles and contains 48-144 cubic miles of molten rock. The findings are being presented at the American Geophysical Union Fall Meeting in San Francisco. If the Yellowstone supervolcano were to blow today, the consequences would be catastrophic. The last major eruption, which occurred 640,000 years ago, sent ash across the whole of North America, affecting the planet’s climate. Now researchers believe they have a better idea of what lies beneath the ground. The team used a network of seismometers that were situated around the park to map the magma chamber. Dr. Jamie Farrell, from the University of Utah, explained: “We record earthquakes in and around Yellowstone, and we measure the seismic waves as they travel through the ground. The team found that the magma chamber was colossal. Reaching depths of between 1 to 9 miles, the cavern was about 55 miles long and 20 miles wide. It pushed further into the north east of the park than other studies had previously shown, holding a mixture of solid and molten rock. 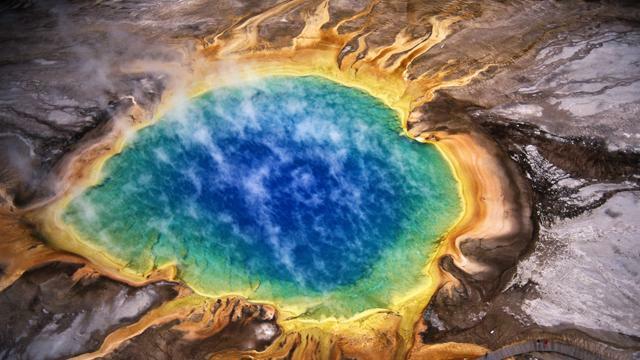 “Yes, it is a much larger system… but I don’t think it makes the Yellowstone hazard greater,” explained Prof. Bob Smith. He added that researchers were unsure when the supervolcano would blow again. Some believe a massive eruption is overdue, estimating that Yellowstone’s volcano goes off every 700,000 years or so. However, Prof. Bob Smith said more data was needed, because there had only been three major eruptions so far. These happened 2.1 million years ago, 1.3 million years ago and 640,000 years ago.